The Jaguar XE marks a return of the Coventry based car-maker to the Small Prestige Luxury Saloon class. Its return marks its new rivalry with the BMW 3 series, Mercedes C-Class, and the Audi A4. The last time Jaguar had a crack at the big German three, its X-type failed to impress, largely because it was little more than a re-bodied Ford Mondeo. The Coventry-based car-maker is taking no such chances this time; the XE is an all-new model, powered by a new range of 2.0-litre petrol and diesel engines as well as a proven 3.0-litre V6 engine. The Jaguar falls slightly short on the Spatial department. It’s slightly stuffier than its rivals in the class. The Jaguar’s wide opening and low load lip are welcome though. It costs extra to specify split-folding rear seats, the mechanisms for which looks and feels more like an afterthought than something that should be appearing on a £30,000 car. The rear seats themselves are also tight on space, not to mention access via narrow door openings. Once in, anybody taller than 6ft will find their head brushing the roof, and while knee room is sufficient, there’s not a huge amount of space for your feet. Middle seat passengers are squashed in further still and made to straddle a particularly wide lump in the floor. No such complaints about those in the front of the XE, where there’s plenty of elbow room and several useful storage compartments. The Jaguar is fairly competitive in soaking bumps on the worst roads. Choose a larger wheel size and I’d also recommend specifying the optional Adaptive Dynamics suspension to help soften the ride. The so far tried Jaguar’s 2.0-litre petrol engine in its high output guise. It’s not the most aurally satisfying of units, being louder at idle than Audi’s 2.0-litre petrol engine, and sounding strained above 5,000rpm. The 2.0-litre diesel is also fairly noisy, particularly at idle and when accelerating from low speeds, although the flagship twin-turbo version is much smoother. The XE begins to shine once up to speed, where engine noise fades away, there’s barely any wind noise and even the tyres produce nothing more than a quiet hum. Throw in a great driving position, and the result is a very comfortable car for long journeys. For the most part, the XE’s dash is on a par with those of its German rivals, albeit sacrificing the last five percent of perceived build quality for a welcome touch of flair. Witness the automatic gearbox controller that rises dramatically from between the front seats. The location of the heater controls in their own panel rather than within the touchscreen system is a good move as far as ease of use is concerned. However, I wouldn’t bother specifying Jaguar’s optional TFT upgrade in place of the conventional dials, because it is nowhere near as slick as Audi’s Virtual Cockpit. The main touchscreen in the center of the dash is at least intuitive to use, and all models get a decent satnav system as standard. As Jaguar’s smallest car, the XE should be easy to place on the road, and for the most part that’s true enough. However, the swollen body panels that look so good on the outside also make the car slightly wider than it feels from the inside. Rear visibility is restricted by a small, high-mounted window that distorts the shape of any following vehicles. Those Problems aside, the XE is as easy to drive as any other models in this class, with a lovely, consistent weight to its controls and a smooth response from its engines. The six-speed manual gearbox isn’t the slickest, so consider upgrading to the eight-speed automatic, which generally shifts smoothly, even if it can be a little eager to change down. Put simply, there is no other car in its class that handles as well as the XE – and that’s quite some statement when you consider the standards set by German rivals. The rear-wheel-drive Jaguar’s steering is quick to respond and has just the right amount of resistance when you turn the wheel. Its chassis is also beautifully balanced, and not deflected by mid-corner bumps. Jaguar also offers an all-wheel-drive upgrade which does nothing to upset the car’s poise, but simply adds a bit more practicality for the winter months. An XE powered by the flagship supercharged V6 petrol engine is a serious performance car, and the 2.0-litre turbo petrol model is by no means a slouch. Only the lower-powered diesel might fail to quench your thirst for power. Jaguar offers a 3-year unlimited warranty on the car. 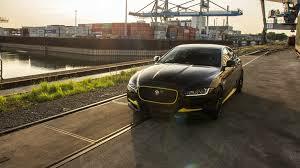 The Jaguar XE diesel is among the most fuel-efficient models in its class, the 161bhp version returning 74mpg on the EU Combined cycle, while the 177bhp model manages 67mpg, and the 237bhp 54.4mpg. In real-world testing we averaged between 45-55mpg from these engines, placing the XE in line with the best opposition. Jaguar’s 2.0-litre petrol engine returned up to 45.1mpg in official tests, but in reality, you’ll be doing well to get more than 40mpg in normal driving. Opt for the 3.0-litre V6 S and you’ll need considerable restraint to coax much more than 30mpg out of it. The Jaguar XE scored the maximum five stars when crash tested by Euro NCAP, and all models come with six airbags. Every XE also gets a forward collision assist system that can automatically apply the brakes if it senses an impending impact with the vehicle in front, as well as road sign recognition that displays the current speed limit to the driver (admittedly with mixed results) and lane departure warning. The XE is also the first car available with All Surface Progress Control, an advanced traction and stability control system that can help the car maintain a constant speed on slippery surfaces. 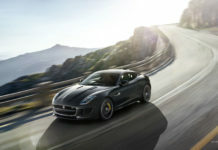 Jaguar F-Type – Can it battle the Porsches?